I have been a collector of USA postage stamps for many years, but a few years ago I decided to expand my collection to include duck stamps. However, I soon discovered that nobody in the UK supplied this material except the odd USA federal government issue. I therefore chose to take up the challenge, and so far as I am aware, I am the only supplier in Great Britain of the complete range of conservation and duck stamps. 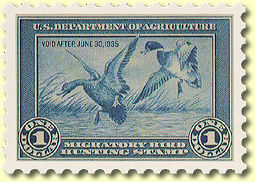 This includes British stamps issued by the Wildlife Habitat Trust, pictorial and text stamps issued by the USA federal and state authorities, Indian Reservations and local conservation societies, plus other countries such as Argentina, Australia, Canada and Provinces, Denmark, Iceland, Israel, New Zealand and Russia. The service offered is mail order only, although I do occasionally attend stamp fairs. My pricelist spans over 30 pages and is too large for the site so please contact me for further information about this exciting subject and a free list. I also supply mint and used postage stamps of USA and am a member of the American Philatelic Society (APS), the National Duck Stamp Collectors Society and the American Stamp Club of Great Britain.